You can allow members or contacts to add pictures to their records. Member photos can appear within member profiles, member directories, featured member gadgets, and on forum posts, depending on various settings, including privacy settings. The first step in adding member pictures is to add a picture field to your common fields – if you want pictures to appear for all contacts – or to your membership fields – if you want pictures to appear for members only. You can add multiple picture fields. For example, you might add one for a profile photo or avatar, and another for a company logo. Pictures added using picture fields do not count towards your file storage limits. 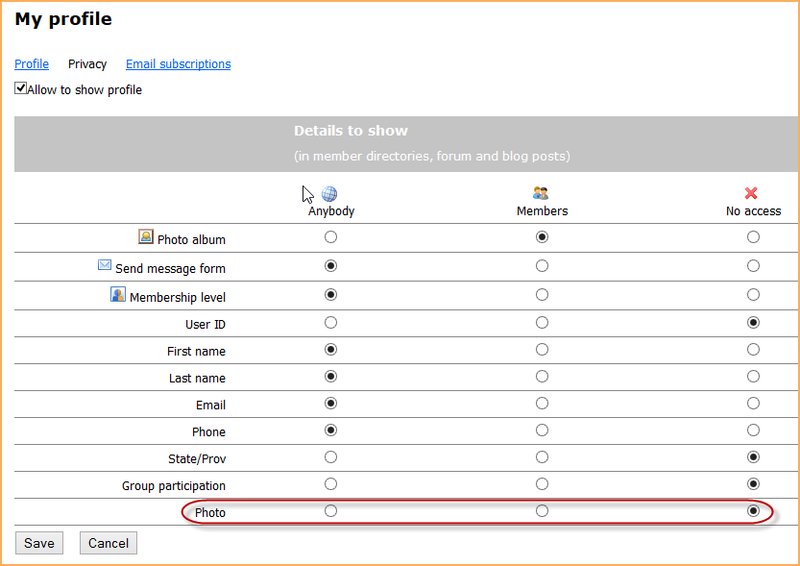 To add a picture field to your membership fields, hover over the Members menu and select the Membership fields option. To add the field to your common fields, hover over the Contacts menu and select the Common fields option. Select Picture as the field Type. Enter a Field label. If you want this field to appear on the Wild Apricot member app, you should set the field label to Photo. Under Options, you can choose whether to restrict the field to admin access only, so that even members cannot add or modify their own pictures. Under Others access, you can control who else can view the pictures. Note that this is a default setting which can be changed by each member from their privacy settings. 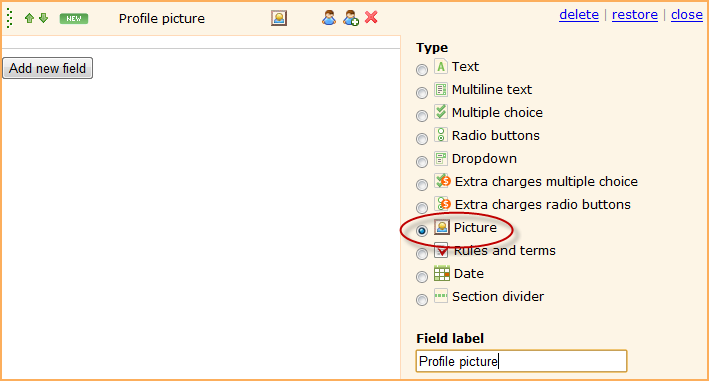 Move your picture field so that the membership fields or common fields appear in the order you want. 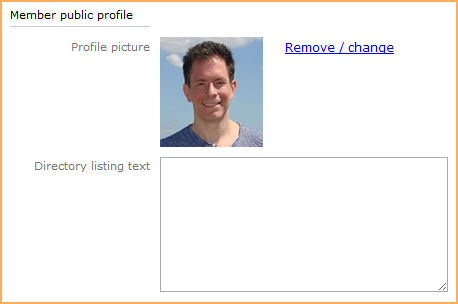 Now, with a picture field in your database, an option to add a picture appears when a new member or contact is added. Picture fields can store images with the following file types: .JPG, .GIF, .PNG and .TIF. Images are displayed at a maximum size of 110 x 110 pixels. For best results, uploaded pictures should be sized to these dimensions. Images larger than that will be automatically resized for display. Once the picture appears on the contact details page, you have the option to change or remove it. 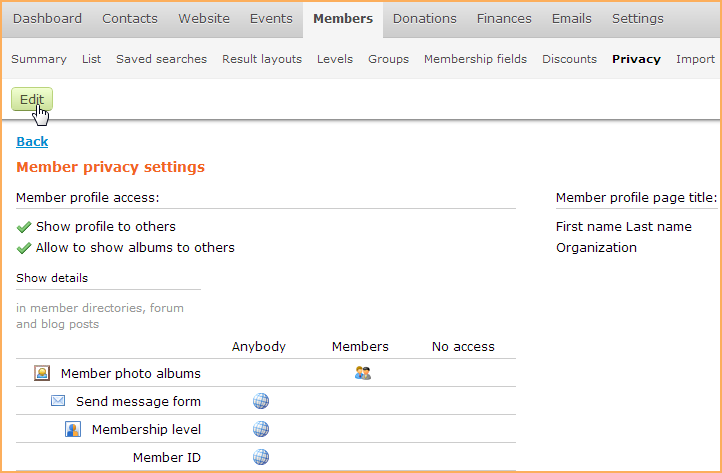 Members can also add or modify pictures from their member profiles. Member and contact pictures will appear on the contact details screen within admin view. A member's picture may also be displayed within their posts on forums, depending on your forum settings, and can appear in member directories, featured member gadgets, and membership cards, depending on your gadget settings. 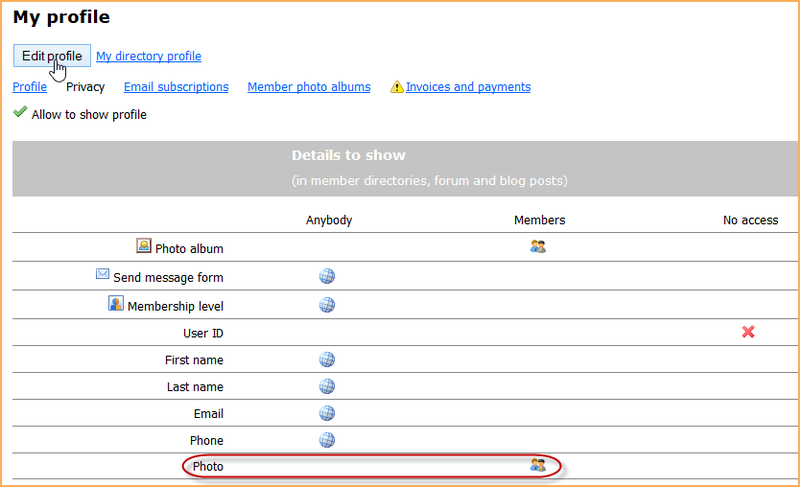 Member pictures can also appear on the member's public profile page, accessible from a member directory. Administrators can control whether member pictures – and other membership data – appear to the public and other members on member directories and forum posts. As well, individual members can override your privacy settings and control whether their pictures and other data will appear to the public and other members. To set the privacy defaults for member pictures, an administrator clicks the Settings menu then clicks the Privacy option within the Members section. On the screen that appears, the administrator clicks the Edit button to enter edit mode. After clicking the Edit button, administrators can choose whether information stored in individual contact fields and membership fields will appear to the general public, to members only, or to no one other than administrators (and the member him or herself). From the Privacy settings page of their member profile, members can click the Edit profile button to override the default privacy settings. 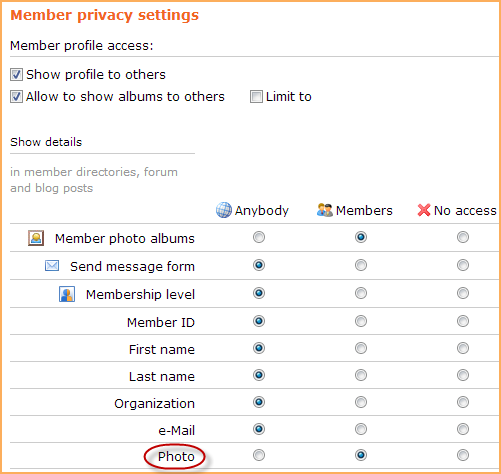 After clicking the Edit profile button, the member can choose for themselves who can view their pictures and other data. The Insert picture window and File management screen can only display thumbnails for graphic images that use the RGB color model. If you upload an image that uses the CMYK color model (used for high quality printing), a placeholder thumbnail will be used in place of an actual thumbnail. For more information on color models, click here.